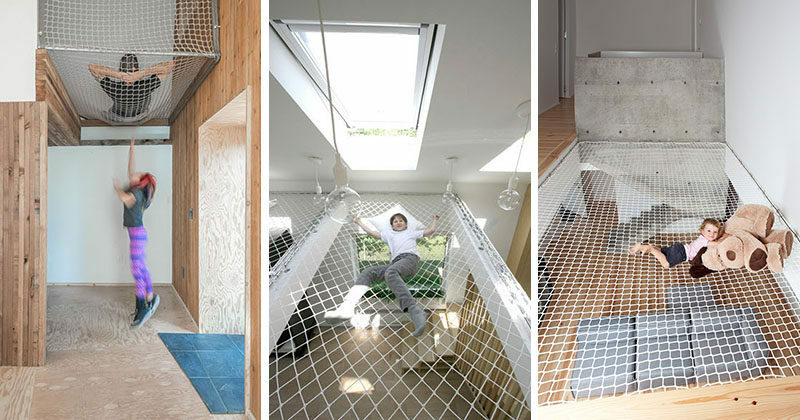 Suspended nets are a fun way to make a space more comfortable, brighter, and more memorable. They provide a great nap spot, let natural light pour through them, and add an element of uniqueness to the interior of your home or office. Today we’re sharing 10 examples of nets in both homes and offices that make living and working more comfortable and much more interesting. 1. 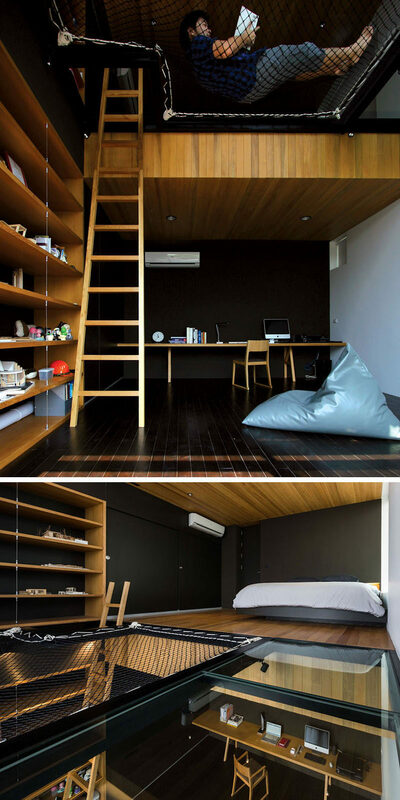 The lofted net in this home provides a fun hideaway for the kids and creates the perfect reading nook. BAOSOL designed this off-grid timber home in Colorado. Photography by Andrew Michler. 2. Suspended nets in this office provide a fun place to work and collaborate with coworkers in a relaxed and comfortable environment. Paralelo Zero designed this modern office in Portugal. Photography by Francisco Nogueira. 3. 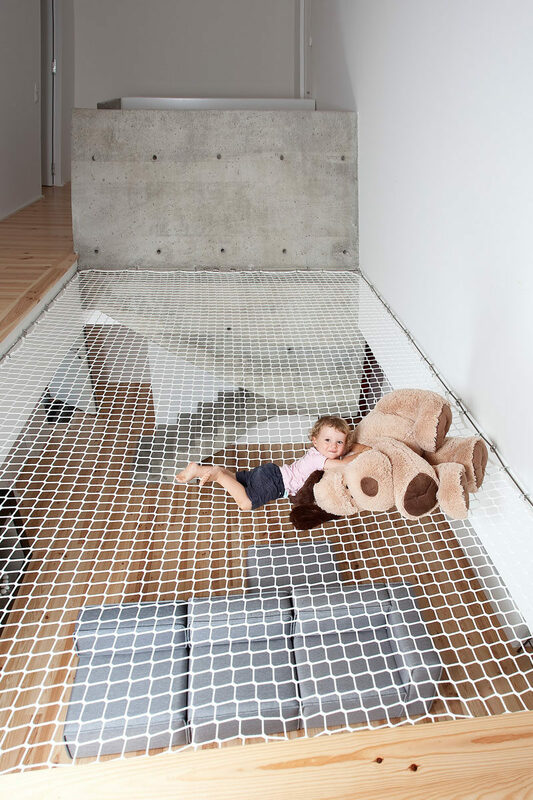 The net above the living room in this modern home creates a play space for kids, and a relaxing spot for grownups. PYZ architecture designed this house in France. 4. The loft space in this teenager’s bedroom is made up of a sleeping area, a net lounge, and a glass floor that makes it easy to see what’s going on down below. Architecture by IF (Integrated Field Co., Ltd.). Interior Design by Porntida Kruapat & IF. Photography by Wison Tungthunya & IF. 5. The nets in this children’s bedroom and study space provide a bright spot to lounge and play. Ruetemple designed this children’s bedroom and study space in Moscow, Russia. 6. 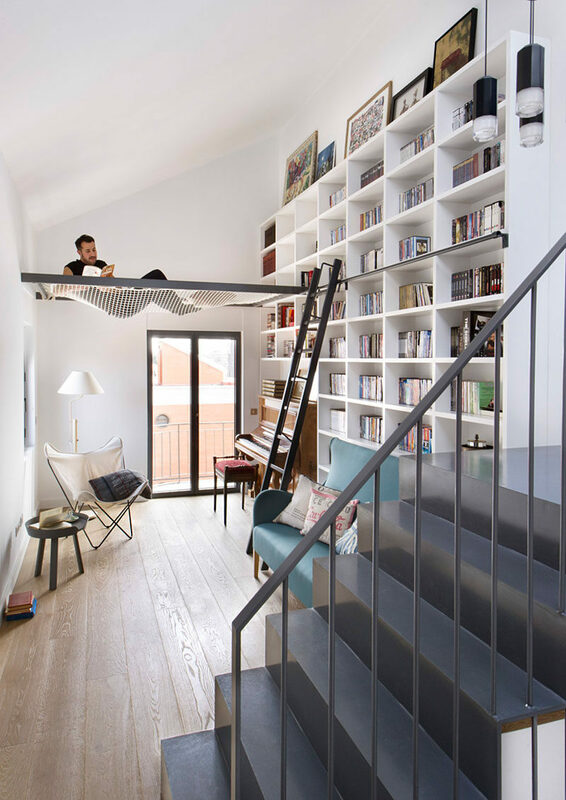 This book room features a large system of suspended nets that create the perfect spot to curl up with a book, a game, or spy on the people down below. Andrew Maynard Architects designed the modern extension of this family home. Photography by Peter Bennetts. 7. The net above the living room of this family home creates a fun play spot and keeps the living room bright by allowing more natural light in from the windows upstairs. ALTS Design Office designed this modern family home in Kyoto, Japan. 8. A suspended net in this living room creates a lofted space that’s idea for reading and lounging in style. Egue y Seta designed this house in Barcelona, Spain. Photography by VICUGO FOTO. 9. 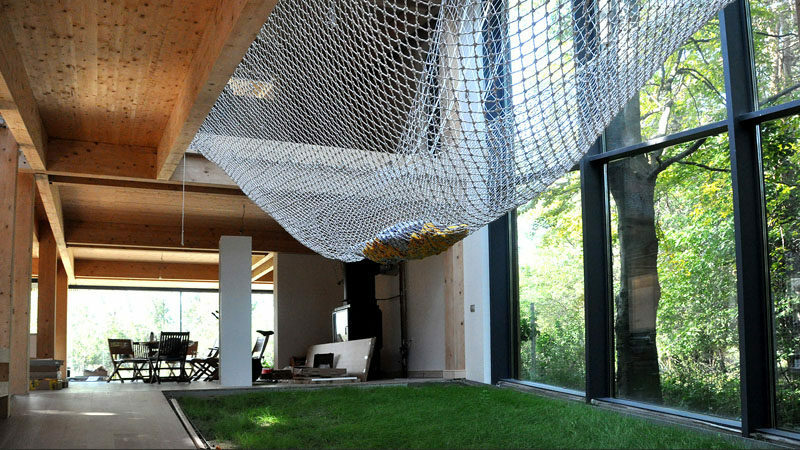 The large net in this home allows loungers to feel like they’re actually hanging outside in a hammock thanks to the floor to ceiling windows on one side and the patch of real grass underneath. Tecto Arhitectura designed this passive house in northern Romania. 10. The large net above the living room in this home makes for a fun play area for the kids and a relaxing spot to lounge. Atelier Idea designed this house in France.